When you build a house, there are approximately 9 zillion decisions to make. The odds are that you’ll get some right and others you’ll question later. 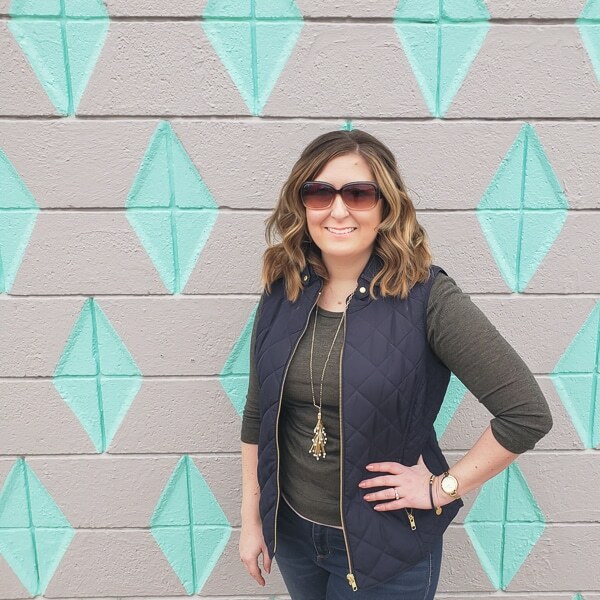 Thankfully, we have ZERO regrets with our decision to do real wood floors from the front entry all the way through to the back patio, including the dining room and kitchen. 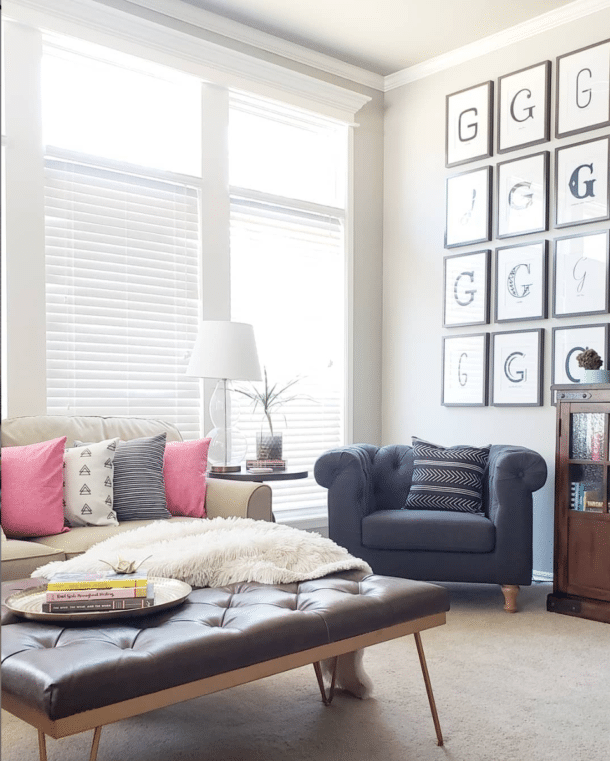 They add warmth to every room while being extremely versatile design-wise. Whether we’re adding modern or traditional accents, the hardwood floors are the perfect backdrop…as long as they’re clean. 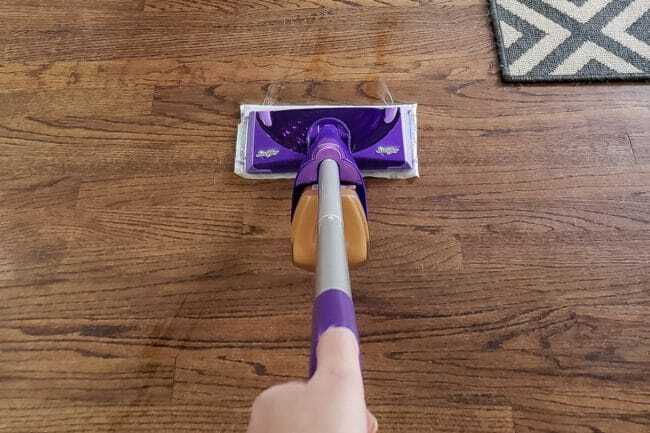 I’ve written before about handling a shedding dog when you have wood floors, but all the rainy weather lately made me realize we’ve never talked about how to clean wood floors. It’s been a very wet few months, which has meant double trouble for our floors now that we have Gus. We have eight paws coming in and out of the rain instead of four. Even with doormats inside and outside the back door AND keeping towels handy to wipe down muddy puppy feet, the wood floors have been covered in a thin haze of mud for weeks on end. When the floor is dirty, I’m less motivated to keep everything else clean, so I knew I had to take action before things got out of control. Since cleaning is far from my favorite activity, I needed a simple solution to clean the hardwood floors. I found the answer to my muddy problems at Walmart! 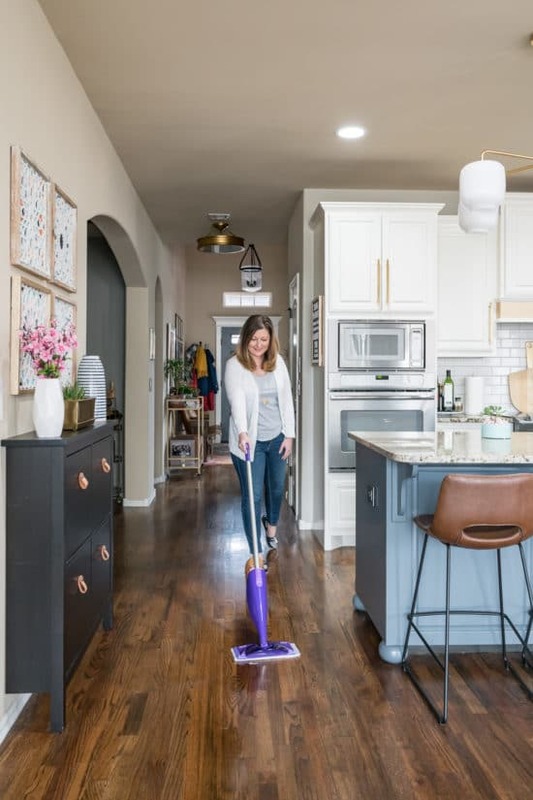 At our old house, I had a Swiffer WetJet for the tile floors, but didn’t realize it works on finished wood floors as well. Hallelujah! 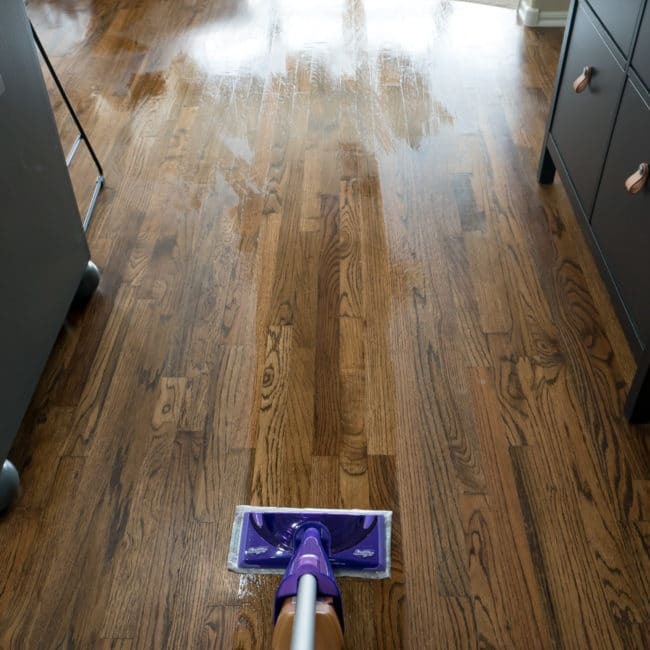 The WetJet Wood Cleaner was formulated to dry quickly, making it safer for your floors than a traditional mop. The soft microfiber-like pad is gentle, but strong enough to handle all the muddy paw prints you can throw at it. The best part – it’s so quick and easy to use. There’s a button on the handle placed perfectly for your thumb. Pushing it shoots the cleaning solution out in front of the microfiber-like pad as seen below. In a few minutes, I had the whole area by the back door cleaned and the process was quick enough I decided to just keep on going down the hall to the front door. 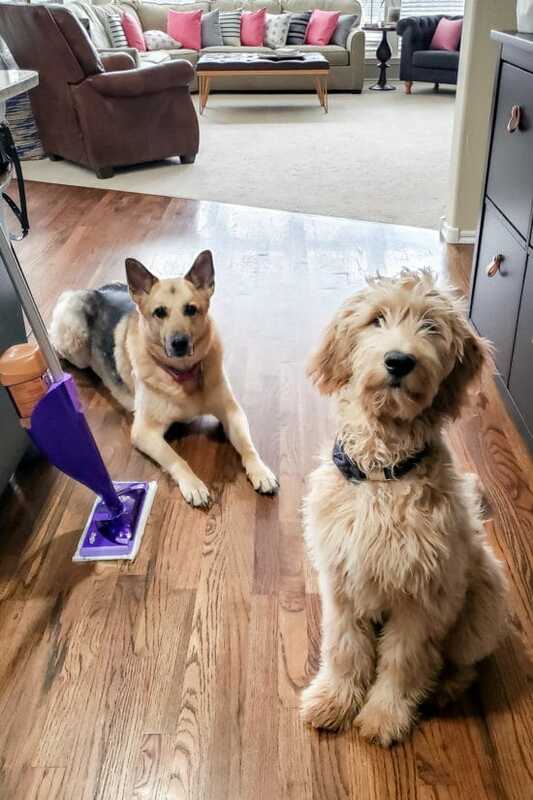 Although the cleaner dries quickly, I found out it’s best to put the dogs in the other room while I’m actively mopping to avoid clean paw prints. No matter how hard they are napping, in the short time the floor is drying, they wake up and run all over it. You’ll also want to be strategic about where you start and end so you don’t get trapped in a corner. It works well for me to start using my WetJet by the back door and making my way into the office by the front door. When I got to the office, I was equally horrified and excited to see how much dirt and grime the WetJet pad had picked up. Keep in mind that I vacuumed really well RIGHT before using the WetJet because there were also leaves all over the floor. Gus loves to drag them in the house. I’ll never rely on just vacuuming again after seeing this! 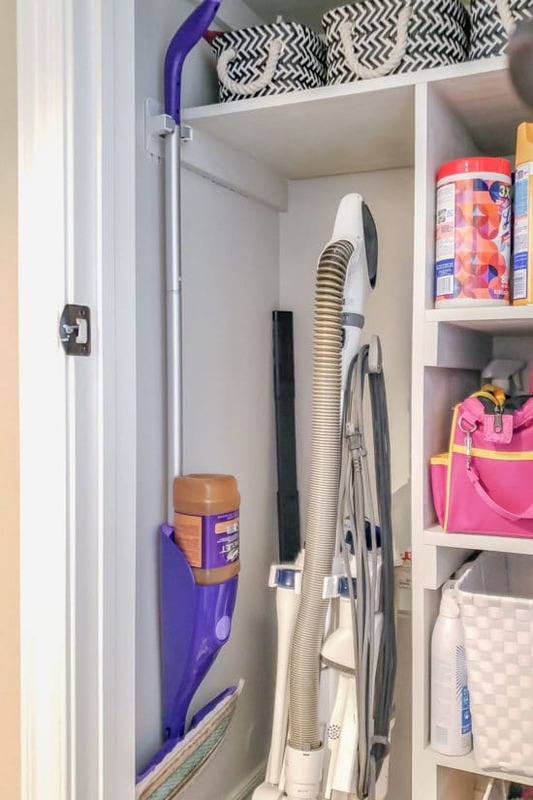 By the time I was done cringing over the effectiveness of the microfiber-like pad, the floors were about dry and I could put the WetJet away in the cleaning closet. Now I’m prepared for the next rainy day full of muddy puppies. I am so glad I no longer have to sacrifice the pretty wood floors to enjoy the dogs in the spring! I too just purchased the wood floors swiffer. 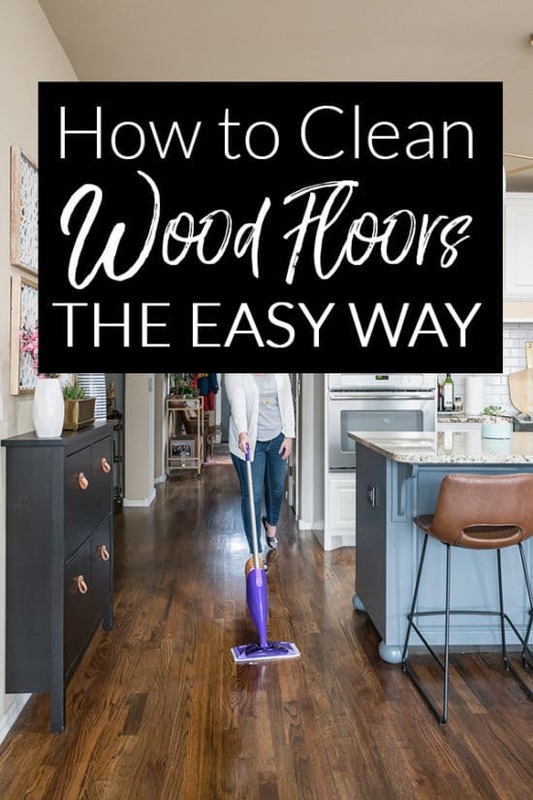 I’ve used it twice and we have true hard wood floors I’m noticing that when the floor is wet it looks great but when it dries it looks like there are spots that are streaky I’m afraid the product maybe starting to out a build up on my floors. Have you noticed that problem yet? Hmm, that hasn’t happened to me yet and I’ve used it a few times. I’ll pass this along to Swiffer to see if they have any tips or advice. 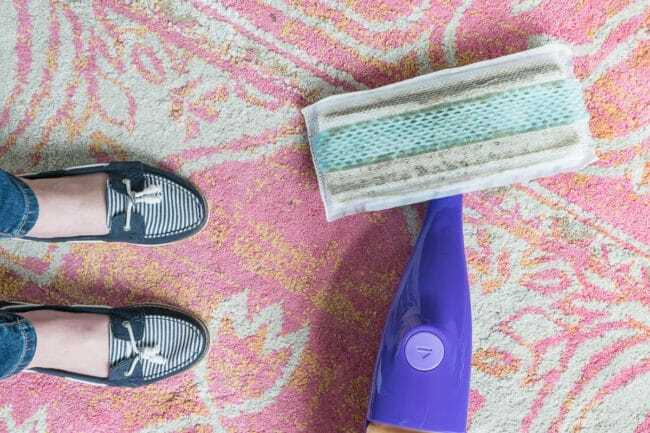 No one wants streaky floors AFTER taking the time to clean them!